The Seven Ladders Canyon (Romanian: Canionul Șapte Scări) is a mountainous canyon carved by the Șapte Scări Brook in Romania in the county of Brasov, south of Timisu de Jos village. It is considered to be one of the main tourist attractions from the Piatra Mare massif. The canyon has been carved in Jurassic limestone and is composed by seven waterfalls, the tallest being 35 metres (115 ft) high. The trail within the canyon is arranged with metal stairs and platforms. 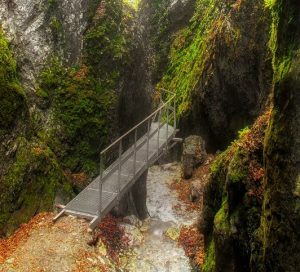 7 stairs Canyon, or the “subdivision” of Piatra Mare Mountain miracles, is composed of exactly 7 slope bits illustrating the 7 waterfalls that give the name of the canyon. The 7 steps pass with heights between 2.5 meters and 15 meters turn into cascades when the water volume of the river Seven Stairs increases. The 7 Stairs Canyon (or Seven Ladders Canyon) is a breathtaking attraction in Romania, near Brasov, one of the most beautiful cities in eastern Europe. 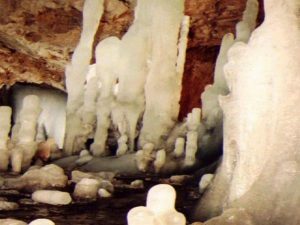 The Ice Cave/Pestera de Gheată was formed in a grotto of the travertine massif and bears this name as the water infiltrations are freezing in the guise of stalactites and stalagmites which are thickening during winter and are melting down late in spring or in summer. The cave is 60 meters long but only the entrance area is available for visitors. You may enjoy the sun in lounge chairs arranged around pools for about 1,500 people. Smile Aqua Park has been built several years ago on the location of the old swimming pool of the Noua district which was appreciated by locals in the past as it was one of the few open air swimming pools in Brasov. 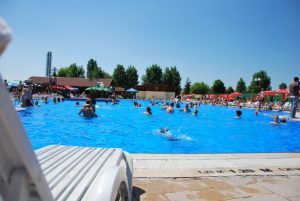 This aquapark has now several swimming pools, an Olympic sized one of 50 meters and others for children too and has also many facilities of a modern aqua park. There are also food and beverage stands, the only problem is that Brasov being a region surrounded by mountains, it is pretty rare in summer too that there are sunny and hot days throughout the day as it frequently occurs that the day seems perfect in the morning but in the afternoon it is already raining. So counting all the sunny and beautiful summer days there are at most 60 days in summer that the stay at the aqua park can be enjoyed and even then, mostly in weekends. The adventure park is an outdoor sports and leisure activity, a very good way to spend your free time with your family and friends. 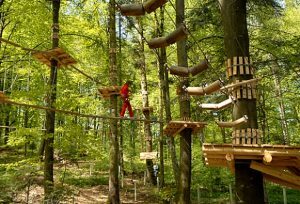 Parc Aventura Brasov has 15 routes with progressive levels of difficulty. Each participant to adventure receives a safety equipment of 2 carbines which shall be used permanently for the participant’s safety. Each route has its’ difficulty level which is symbolized by a specific color. Biserica Neagră or Black Church is a church in Brașov, a city in south-eastern Transylvania, Romania. It was built by the German community of the city and stands as the main Gothic style monument in the country, as well as being the largest and one of the most important Lutheran (Evangelical Church of Augustan Confession in Romania) places of worship in the region. Bran Castle, situated near Bran and in the immediate vicinity of Braşov, is a national monument and landmark in Romania. The fortress is situated on the border between Transylvania and Wallachia, on DN73. 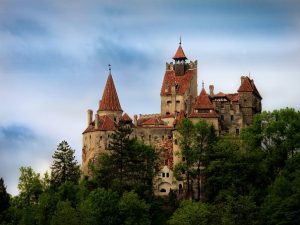 Commonly known as “Dracula’s Castle” (although it is one among several locations linked to the Dracula legend, including Poenari Castle and Hunyad Castle), it is often erroneously referred to as the home of the title character in Bram Stoker’s Dracula. There is, however, no evidence that Stoker knew anything about this castle, which has only tangential associations with Vlad the Impaler, voivode of Wallachia, the putative inspiration for Dracula. As discovered by the Dutch author Hans Corneel de Roos, the location Bram Stoker actually had in mind for Castle Dracula while writing his novel was an empty mountain top, Mount Izvorul Călimanului, 2,033 metres (6,670 ft) high, located in the Transylvanian Călimani Alps near the former border with Moldavia. Stoker’s description of Dracula’s crumbling fictional castle also bears no resemblance to Bran Castle. 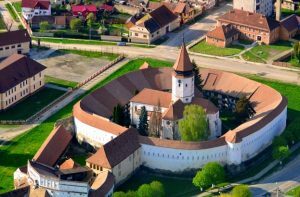 The Prejmer fortified church (Romanian: Biserica fortificată din Prejmer; German: Kirchenburg von Tartlau) is a Lutheran fortified church in Prejmer (Tartlau), Brasov County, in the Transylvania region of Romania and the ethnographic area of the Burzenland. 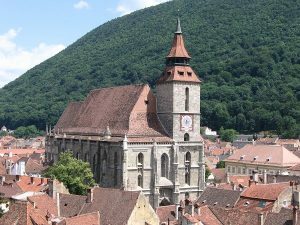 The church was founded by the Germanic Teutonic Knights, and then was eventually taken over by the Transylvanian Saxon community. Initially Roman Catholic, it became Lutheran following the Reformation. Together with the surrounding village, the church forms part of the villages with fortified churches in Transylvania UNESCO World Heritage Site. 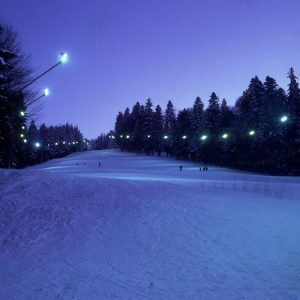 Predeal is one of the most appreciated Romanian winter resorts that offers a dream like scenery. 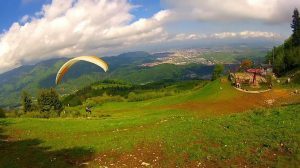 The resort it is located in Brasov county, on the summit separating the Prahova Valley from the Timis Valley and it is surrounded by Bucegi Mountains, Postavaru Mountains and Piatra Mare Mountains. Clabucet Slope is a medium difficulty slope with a length of 2.1 and a tilt of 20°. It features a ski lift. Reptile: testoasa, testoasa de uscat, pitonul tigrat, boa. Pasari:strutul, emu, rata salbatica, rata muta, rata mandarina, gasca domestica, lebada neagra, lebada alba gat negru, barza europeana, porumbelul comun, turturica, bibilica, curca, prepelita, gaina, paunul, fazanul auriu, fazanul argintiu, fazanul de vanatoare, uliul porumbar, uliul sorecar comun, soimul de iarna, acvila tipatoare, canarul, papagalul rosela, papagalul perus, papagalul micul alexandru, papagalul capra, papagalul nimfa, papagalul agapornis, cucuveaua, bufnita, cinteza australiana. 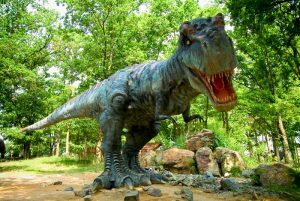 Dino Park is the only dinosaur theme park in Romania and the largest in South East Europe. There are 47 life-size dinosaurs, each certified according to the latest scientific and paleontological discoveries made. They are really special, because they are created from fiberglass and a special type of resin, with a guarantee of 50 years. A special place, an area of 1.5 hectares, natural environment that provides children and not only a unique experience.